We feel overjoyed in being able to announce the publication of this comprehensive work on Sankara’s views on the Advaita Vedanta. We had temporarily to postpone the publication of ‘The Updanishadic Approacy to Reality’ which had been entrusted to us earlier, for fear that the author may not be able to finish this last work that emerged from his pen owing to the unexpectedly rapid approach of cataract which came in the way of the indefatigable zeal with which his entire life has been dedicated to the task of restoring Sankara’s teachings on their pristine purity freed from all later encrustations in the shape of misinterpretations by recent writers. The publication has been financed by the branch of Karyalaya out of the contributions from generous friends, who, we learn from the secretary, prefer to remain incognito. As there was an increasing demand for this enlightening work of Swamiji, which was out of stock, we have pleasure in bringing out this edition. Earnest students of Sri Sankaracharya’s Advaita system, have reason to be bewildered in their attempt to ascertain his exact teaching about the message of the Upanishads to seekers of the Highest Good universally believed by orthodox follow- ers of the Sanatana Dharma, to have been promised by those sacred revelations to man. This is so neither because of the obscurity of style or the absence of precision of thought expressed in the writings of Sankara himself, nor because of the paucity of explanatory literature on the subject. On the contrary, there are two fertile y sources of this confusion. In the first place, 'Sankara’s works are now generally studied and taught by learned Pandits who; are mostly guided by popular Sanskrit works relying on one or more of the conflicting sub-commentaries claiming to propound Sankara’s thought. And in the second place, neither the professors nor the oriental scholars, who undertake to write on the subject in English, seem to be earnest in entering upon a comparative study of the varying estimates of Sankara presented by the sub—commentaries and the adverse critics of (Sankara) belonging to other schools on the one hand, and in the original works of Sankara, independent of the commentaries on the other, before arriving at any conclusion about the genuine views of that Acharya. I have attempted to invite the attention of scholars in general and the Vidwans of out country in particular, to the urgency of such a study publishing several pamphlets and books as well as n few elaborate works in Kannada, Sanskrit and English. Owing to my rapidly failing health and eyesight, I have now thought it fit to condense my views Within the limited compass of this small book appealing to the thoughtful Vedantins of our country to consider how far my conclusions Are acceptable and to offer their candid opinion in this matter, so that all the assessments of my humble opinions, may be consolidated in the symposium proposed to be published by the Karyalaya. The booklet now presented to Vedantins for critical appreciation, naturally contains my personal views as a sample of what is expected from the contributors to the forthcoming symposium. (1) I have taken the Sutra Bhashya as the chief court of appeal for the obvious reason that it is an exegetical work which comprehends not only Sankara’s considered conclusions and lays down the principles by which an interpretation of Advaita-Vedanta, has to be guided, but also because it convincingly shows the critical qualified seeker how the truth of Advaita Vedanta may be intuited as corresponding to the real nature of the Self of each one of us. (2) Quotations from the Gita—Bh5shya or any other commentary, are drawn upon only to confirm any conclusion based upon the Sutra- Bhashya. (3) I have tried to classify the important misconceptions under particular heads, and have produced my vouchers mainly in the form of citations from the Sutra-Bhashya. And lastly (4) I have tried to show how Sankara’s teachings can be corroborated by the declarations of the only traditional teacher, Sri Gaudapadacharya, whose classical work is still ‘available for reference. I am fully aware that many an item of discussion noticed here, might have been developed and presented as an independent work by itself but my object was only to list all the important topics in a neat and compact brochure for the ready reference of the critical scholars. I hope that the Table of contents and the Word-Index will be of some service to the reader in this direction. There are a number of misconceptions that have gained currency, both in India and abroad, with regard to the biography, mission in life and the lasting work wrought by the great Sankaracharya of world-wide fame. And in my humble opinion, any assessment of his Vedantic System, is bound to lose much of its value, unless these misconce-ptions are first removed from the public mind by a consensus of opinion of Vedanta-vidwans and scholars interested in the teachings of the Upanishads. Except for some poetical or half-poetical legendary works called Sankara- Vijayas, written or caused to be written by authors biased towards their own peculiar doctrines or religious practices, long after the departure of the Acharya, there are no reliable historical accounts of his life or the reforms he effected in society. Even the place and date of his birth or exit, his parentage and the chief incidents in his life, have not' been definitely ascertained till to-day. That he was the founder of the Advaitic System of Vedanta, that he resuscitated some religious sects and placed them on a firm footing, and that he established four different mutts in the four cardinal directions of India with the object of propagating Vedanta, are some of the prevalent popular beliefs which are yet to be corroborated by indisputable historical evidence. Of these three Institutes of Vedanta collectively known by the name of the Prasthanatrayi, the canonical Upanishads, about thirteen in number, form the basic source which Sankara has recognized, as exclusively revealing the nature of Brahman or Reality. One who is of the highest type of qualified aspirants, should be able to see the Truth immediately without any other extraneous assistance from this Sruti-Prasthana alone. But for those who are not up to the mark, the study of the Bhagvadgita or the Smrti-Prsthana is also necessary. That work not only explains the Vedantic teaching concerning Brahman or Atman compendiously, but also sets forth at length, the needful course of discipline (Sadhana) besides the central teaching (Siddhanta). Seekers of the middling type, therefore, have to supplement the study of the teaching of the Upanishads by undergoing this course before they are able to see Reality with the direct insight, aimed at in Vedanta. And thirdly, the qualified students of the last class, have to master Badarayana's Sariraka Mimamsa also, which has been called the Nyaya Prasthana, that which recommends the method of approach adopted in the investigation of Reality with the aid of Manana (reflection on the significance of the Upanishadic teaching) or Vedantic Reason. 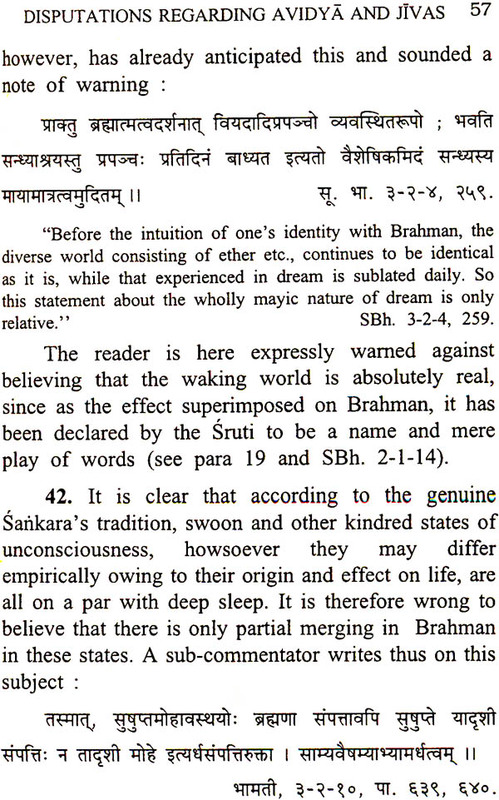 It is in this branch of Vedantic study, where Sankara is at his best not only in making the original source quite intelligible by reducing them to a systematic whole, but also by showing the unique indubitable nature of Vedantic Vision of Atman according to his own tradition in contrast to all other systematizations conceivable. We shall therefore restrict ourselves chiefly to this Acharya's Bhashya on the Vedantic-Sutras in determining his genuine traditional teaching for the purpose of exposing the various misconceptions rampant among modem interpretations.